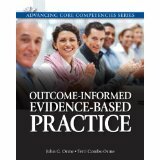 This chapter presents two exemplar cases of the use of Outcome-Informed Evidence-Based Practice (OIEBP). In the first case we see the case of Sandra, a 16-year-old foster child whose provocative behavior threatens what is otherwise a successful placement. OIEBP is especially helpful for demonstrating to Sandra that she does indeed have a problem and engaging her in working toward a successful resolution. The second case involves Dahlia, a 20-year-old college junior from Saudi Arabia. In this case we see how close monitoring of Dahlia’s outcomes is instrumental in identifying the causes of Dahlia’s depression so that she can work directly on those causes. Both cases involve some of the real setbacks and problems in working with clients and illustrate how OIP is useful for dealing with these problems.